Largest online collection of FANUC CNC documentation available. standard features, specifications, and options that were available on legacy FANUC controls FROM 1960s The first NC Control was developed in Japan 1956. used on Machine Tool Types ( Lathes, Mills, Routers, Grinders, Verticals ) Industries include Aerospace and Defense, Automobile, Electronics. GE Fanuc Automation is the leading supplier of computer numerical controls and related products to the machine tool industry with a reputation for innovative and high-performance products. More machine tool builders trust their products to FANUC controls because of our long history of performance and reliability. From multi-axis, high-precision machines to a simple transfer line - Fanuc CNC's provide the highest level of quality and reliability in the industry. We combine open technology with the expertise of a long-term CNC focused company to deliver products and services that will ensure your productivity is continuously improving. A machine tool's productivity is a factor of Performance, Availability, and Information. The Open and traditional CNCs supplied by GE Fanuc Automation enhance the machine's productivity with a new level of easy-to-access information and programming tools right where it matters - at the machine. Fanuc CNC Systems are available for a wide-range of applications such as; grinding, drilling, cutting, milling, punching, turning, woodworking and many more. GE Fanuc traditional CNCs are available on the widest range of machine tools world-wide, because of their high performance and reliability.The Fanuc CNC control unit of all the models in the new line-up is a mere 60 mm thick. The unit incorporates an ultra-compact CNC printed circuit board that fully exploits state-of-the-art LSI and surface mounting technologies. The board is mounted behind the liquid crystal display. These CNCs are the thinnest and most compact currently available.A high-speed serial servo bus and a compact, distributable I/O module have been developed. This allows the C.N.C control unit and plural Fanuc servo amplifiers to be connected by an only single optical fiber cable. Multiple I/O modules can be mounted on the machine operators panel and control panel. This scheme significantly reduces the amount of machine wiring and can contribute to minitiarize machine tool. Production system can be rationalized by FACTOLINK, which can use CNC as a terminal of an online system. The GE Fanuc Series 160i, 180i, 210i and 160is, 180is, 210is are ultra-compact, ultra-thin open CNCs whose development is based on the same concept as the Series 16i, 18i, and 21i. The printed circuit board which is combined with IBM PC compatible personal computer function is mounted behind a color liquid crystal display. The board is constructed using the most advanced LSI and surface mounting technologies. The open CNCs provide the superior control functions of the GE Fanuc CNC together with personal computer functions, while fully supporting future expansion. They are highly reliable and can safely be used in machine shop environments. The CNC and machine can be operated using the personal computers graphical user interface. And also, network functions can be used to exchange information, and database software programs can be used to manage tool files. By employing the most advanced personal computer functions, a machine tool can be turned into an intelligent machine. Application software can be executed under Microsoft Windows 98 and Windows NT4.0 for the Open CNC series i and under Microsoft Windows CE for the Open series is. Machine tool builders can thus develop application software in the same way as if development is being done for an ordinary personal computer. GE Fanuc software (NC library) is used to input/output internal information. This software can be called from the standard Microsoft programming languages (Visual Basic or Visual C++TM) and OLE/DDE interface. Commercially available application software can be installed easily. Contact us today to discuss your Fanuc Requirements. Call us, we're ready to assist you with fanuc. Save Money, our Spare Parts are at Least 50% Below the high Manufacturers Prices. We are an Independent Fanuc CNC Specialist. We are not affiliated to Fanuc UK, Fanuc Ltd or GE Fanuc. © Pennine Automation Spares. All rights reserved. 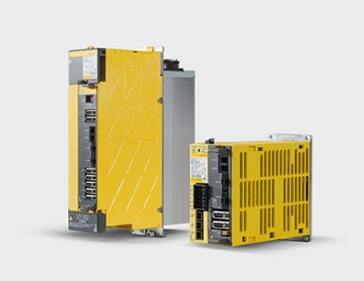 We are an independent Fanuc CNC Service Centre.